Tefal Essential 5 Piece Pan Set: The Tefal Essential Five Piece Pan Set in black includes 20cm and 24cm Frying Pans and 16cm, 18cm and 20cm Saucepans. Made from aluminium with Bakelite handles each pan in the set has a durable Expert non-stick interior for improved food release. The 20cm and 24cm Frying Pans feature Tefal's iconic Thermo-Spot technology which indicates when the pan has reached optimum cooking temperature. The Saucepans all feature vented glass lids. 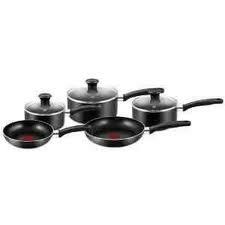 Suitable for all hob types apart from induction, this Five Piece Pan Set is oven safe to 175°C for a maximum of 1 hour. This pan set is dishwasher safe for easy cleaning.